ITS ALWAYS GREAT HERE...FISHING ON YOUR PRIVATE PIER, MOONLIGHT STROLLS ALONG THE BEACH OR WATCHING SUNSETS ON THE BAY FADE INTO STAR LIT NIGHTS. There are not many of these...Enjoy your own private lighted fishing pier, witness spectacular sunrises over the Gulf and sunsets over Little Drum bay. And best of all, if you bring your boat, you can launch and park next door at the paved, private boat launch and leave your boat parked at our private pier. Completed in June 2008, this home has two very large covered balconies facing Little Drum Bay. Watch the kids fish on the lighted pier while you gently sway in the futon hammock designed to hold two adults. Read your favorite book, nap or sip on your favorite drink while watching the spectacular sunsets. Inside you can relax in the spacious and open floor plan designed to accommodate groups of all sizes. The kitchen has all-stainless steel appliances. Gourmet cooks enjoy being able to prepare their favorite dishes, listening to their favorite music while gazing at the views of the bay. Three bedrooms are upstairs but one is downstairs for the occasional late night arrival or grandpa's snoring. The beach is only 1.5 blocks away. Load up the chairs, umbrella and cooler and putter over to the beach to build sand castles, wake board, surf-fish or just kick back and enjoy the views. When you come home, rinse off under the outdoor shower with hot and cold water. At the end of the day, you can play board games with the family, sit out under the stars, make smores over the fire in the firepit or watch movies or TV. 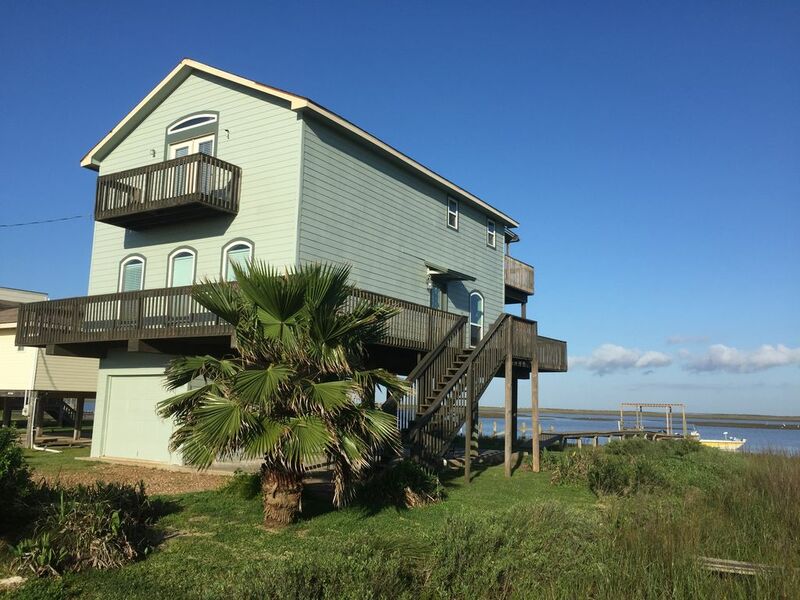 There are a variety of other activities which include local restaurants, putt-putt golf, Moody Gardens, Schlitterbahn water park, the confederate air force museum, and The Strand, a world class shopping area in Galveston. There is no better value in a family vacation that offers this many options. We have added this to the property. Lighted pier with umbrellas, canoe and accessories. There was a terrible wind storm and many of the pickets on the railing upstairs were flapping in the wind. Two were already missing when we arrived so please be careful if you have small children. The bed in the blue room is like sleeping on a steep hill. You’ll both roll to the middle. The fan in that room makes a terrible clicking noise so it’s impossible to use during the night. I would suggest adding blackout curtains on all the bedroom windows so guests can sleep in. It didn’t really feel like vacation because I was up with the chickens at the crack of dawn. There were no wine glasses. We wasted 2 days of our week waiting for a plumber to arrive to fix a toilet that leaked from the bottom all over the floor. The downstairs bed has two mattresses on top of the box spring and it sits rather high so it can be difficult to get into if you are vertically challenged. I’m 5’5” and I had a hard time. The berber carpet has stains and smells. We had ants get into our all of our food in the kitchen, they were everywhere, on top of the stove, microwave, and bathroom. I did report it but pest control was not sent. Instead, we were instructed to spray the house ourselves. The sheets on the beds were sour and the overall condition of the home was dirty with a layer of dust and dead insects on the window sills. I had to clean, sweep, mop and wash linens upon our arrival. Having said all that, we managed to have a wonderful time. The views are breathtaking and the location is ideal. With a little tweaking, this could be the perfect getaway. We had a wounderful time,looking forward to staying again. Enjoyed the views at this place. Very nice beach house that has everything needed for a relaxing weekend. I will be back again soon. We caught a huge black drum and lots of crabs. We had an awesome thanksgiving! The weather was not great, but the location and house made the trip perfect. We enjoyed fishing and crabbing off the dock. Great fun. As always we enjoyed our stay. Crabbing, bird watching, private boat launch next door. During the Peak Summer Season we rent from Friday to Friday. There are discounts for 2 or more week stays.